GSMArena team, 16 March, 2016. All three flavors of Xiaomi Mi 5 run on the Qualcomm's latest and greatest Snapdragon 820 chip. The SoC features Qualcomm's custom built quad-core Kryo CPU. Qualcomm promises up to 2x higher performance than the Snapdragon 810. The basic 32GB model of the Mi 5 has two Kryo cores at 1.8GHz and two Kryo ticking at 1.6GHz. The 64GB (we are currently reviewing) and the ceramic flavors are utilizing 2x Kryo running on 2.15GHz and 2x Kryo at 1.6GHz. All three models utilize the most powerful Adreno GPU to date - the Adreno 530. The 32 and 64GB models pack 3GB of RAM, while the 128GB (ceramic) has 4 gigs of RAM at disposal. The single-core performance is where the Kryo CPU shines. It did noticeably better than any other Android competitor, including the Galaxy S7 Exynos's Mongoose core, and it indeed doubled the performance of its predecessor (the Cortex-A57 within the Nexus 6P). The Kryo is just short of Apple's Twister core, the best performer on the market right now. But it seems Qualcomm is finally on the right track, and it should help Android ease off the number-of-cores-in-CPU race. Quality can and should be valued over quantity. The multi-core performance is better than the Snapdragon 810 chips (Nexus 6P) and matches the Exynos 7420 octa-core processor inside the Galaxy S6 edge+ and Meizu Pro 5. It also edged Apple's latest A9 chip. The latest Exynos models of the Galaxy S7 series are doing better than the Snapdragon 820 chip, though, but don't forget they have additional four Cortex-A53 cores. AnTuTu 6 is a compound test that gauges CPU, GPU, RAM, and UX multi-tasking capabilities. The Xiaomi Mi 5 aced the test and outed the same result as the Galaxy S7. Don't forget the AnTuTu benchmark has an onscreen 3D test which runs at Quad HD resolution on the Galaxy S7. The BaseMark OS II 2.0 is another compound test, which in addition to CPU, GPU, RAM, and OS, also takes in consideration the browser performance. The Mi 5 aced this test too, outing a similar score to the iPhone 6s champ and just few points on top of the Galaxy S7. Now, let's check the graphics out. The offscreen GFX Benchmark 3.1 Manhattan test puts the Adreno 520 (Mi 5) on par with the Mali-T880MP12 (Galaxy S7) and it's twice as good as the GPU inside the Galaxy S6 series. This means whatever version of the Mi 5 you get; the graphics performance should be equally flagship worthy. The Quad HD resolution of the Galaxy S7 takes its toll on the onscreen test and thus the Xiaomi Mi 5 tops the chart with. If the S820's Adreno 530 was to run on the same resolution, we bet the result would turn up the same as the S7 though. 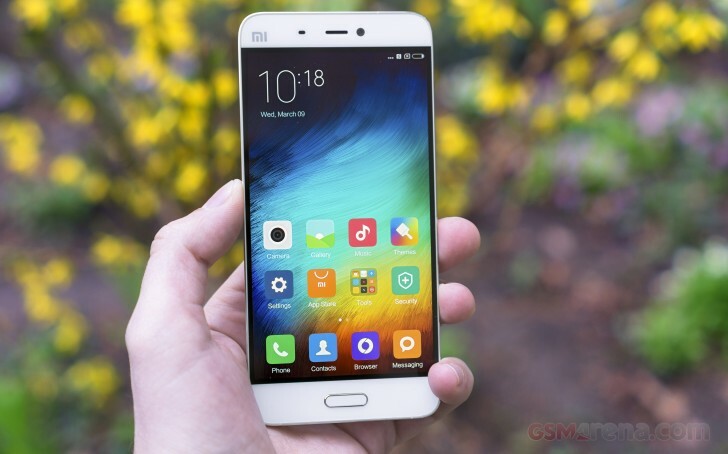 The Xiaomi Mi 5 tops yet another chart - it did excellent on the BaseMark X test. The Galaxy S7 is a whisker behind, which means both devices offer stellar and flagship-worthy GPU performance. Finally, the demanding BaseMark ES 3.1 GPU bench gives the Galaxy S7 GPU's some edge over the Xiaomi Mi 5's. The iPhone still leads here. The new Snapdragon 820 chip lives up to the expectations and delivers stellar performance without depleting the battery in a flash. What's even better - the S820 is much cooler than its predecessor and won't give you headaches on games or benchmarks. We ran the BaseMark ES 3.1 and AnTuTu, twice times each, and we found the Mi 5 to be warm, but far from unpleasant. And it cooled down in less than a minute - something impossible for the Snapdragon 810 phones. So, you can rest assured Qualcomm has taken care of all the issues that plague the previous generation Snapdragons. It did well with the new custom Kryo cores and hopefully those will put an end to the core count race. The new Adreno 530 GPU is blazing fast and looks to be future proofed. The Snapdragon 820 is a flagship hardware worthy for the Mi 5. Note that the 32GB Xiaomi Mi 5 runs on a down-clocked Snapdragon 820 chip and while it will affect the benchmark scores, nobody should be able to tell the difference in real life operation.